I am so excited to be here at U Create! Kari’s site is so full of wonderful ideas and talented people, it is an honor to join the fun. Make it Do is all about being resourceful. “Do what you can with what you have” is my motto. I’m always on the lookout for projects that are easy and beautiful… and don’t cost a lot. Not long ago, I was strolling through Anthropologie online and noticed a wonderful zig zag pillow that really got my wheels turning. The zig zags were so fresh: geometric and yet meandering. I knew I could make something similar that would be a great fit to my home… and much cheaper than the $68 Anthropologie price tag. 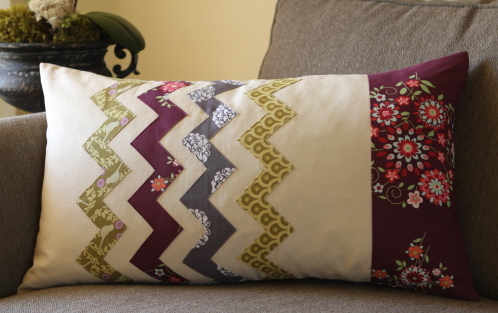 My version of their pillow is softer and less modern… and I love how it turned out. I especially love the technique I figured out for making the zig zags. 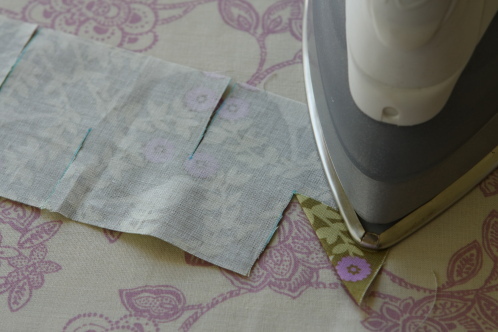 It would be easy to adapt this tutorial to embellish a skirt, dish towel, or table runner. Fabric the same size as pillow form for the front (in my case 16″ x 26″) You might worry this is too small–that I’m not leaving room for seam allowances. I like my pillows to be firm, so I cut my fabric exactly the same size as the form. Once I’ve sewn my fabric with a 1/2 seam allowance, it makes the casing 1″ smaller than the form. When the form is placed inside the casing there is no sagginess… and who likes sagginess? Not me! I used a linen fabric for the texture. Fabric for the back. 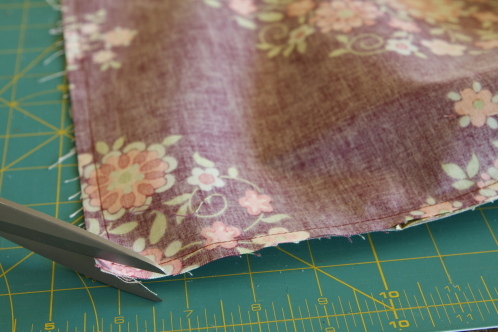 Since I want to make my casing to be removable and washable, I used two 16″ x 17″ pieces. 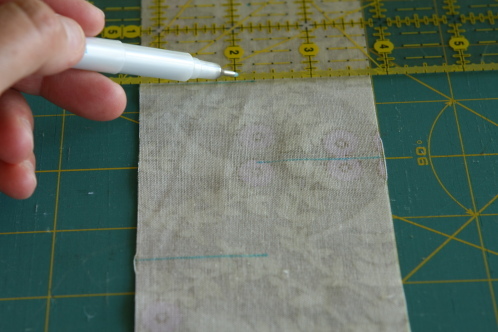 This allows for 2″ seams and a 4″ overlap. 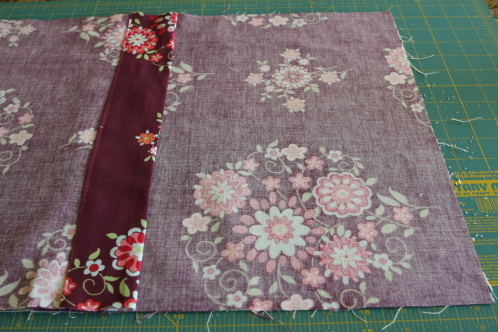 My fabric choice was Amy Bulter’s Love Memento. You will need fabric for the zig zags 3″ wide by about 5 inches longer than your pillow for each zig zag. This gives you some wiggle room to place the zig zags together nicely. 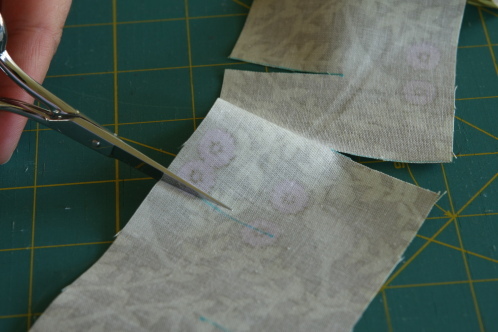 To make your zig zags, cut your decorative fabrics 3″ wide by how ever long you want your zig zag. I made my zig zags about 5″ longer than the pillow so I could have some wiggle room when laying them out. 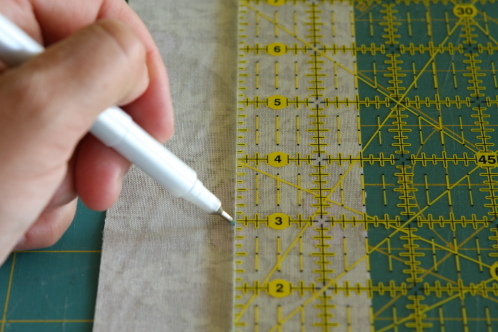 Turn your strip of fabric to the wrong side and using a ruler and a Mark-B-Gone Pen mark a small dot directly in the center (1-1/2″ in from either side) every 1-1/2″ the entire length of the strip. Square the ruler and draw a line from the left to center, then the right to center, alternating every other marked dot the length of the strip. Using a very hot iron with the steam turned off (ask me how I know to turn off the steam… ouch! 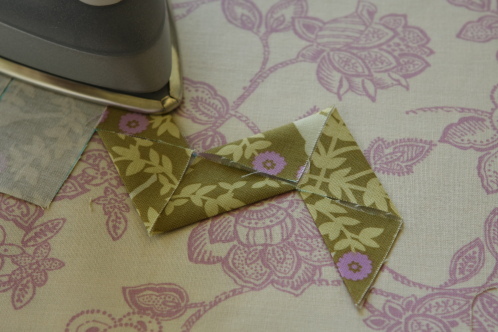 ), fold the first triangle back to the outside edge and press. Press triangles as shown in the photo. Continue pressing all the way down the strip as shown. Be sure to make each point as neat as possible. And once you’re happy with the points, I recommend a little spray starch to keep things in order. On the right side, they will look like this. Space them evenly on your pillow top, and pin them into place. And stitch into place. I used a straight stitch down each side. I also did a little bit of fussy thread matching on my burgundy fabric. It was just too dark to use a chameleon thread like I usually try to get away with. 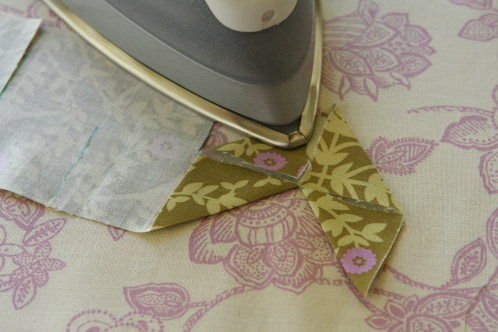 Once stitched, trim any overhang of zigzag fabric even with the top. 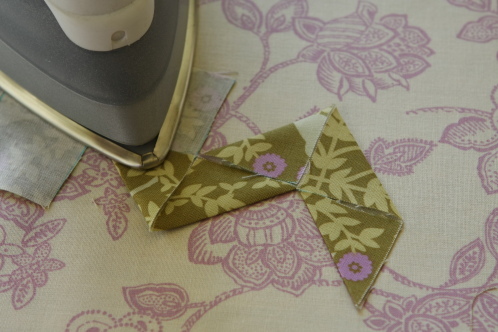 If you are piecing your top, like I did, just be sure the finished dimensions are the same as the pillow form. In my case, my cream linen fabric measured 16″ x 21-1/2″ and my burgundy fabric (Amy Butler’s Love Memento) measured 16″ x 5-1/2″. 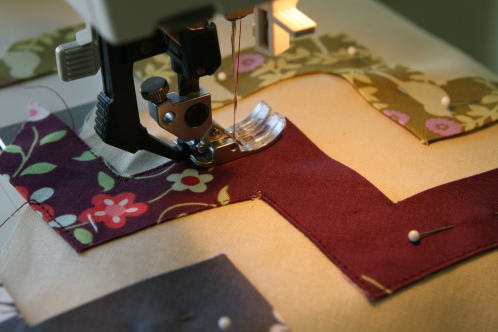 Once they were pieced together with 1/2″ seam, it measures 16″x 26″ exactly. 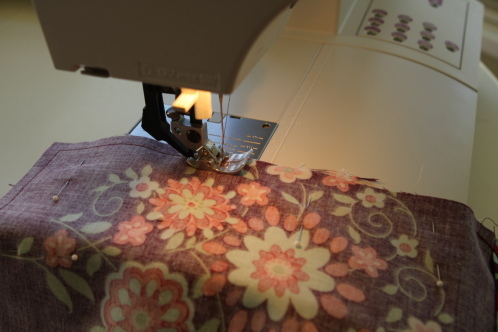 For the two back pieces of the pillow, turn a 1/2″ and then a 2″ hem and stitch. Lay them out right sides together with the top, so the back pieces overlap. Pin front and back pieces together. Stitch all the way around. I like to back stitch where the back pieces overlap. Clip the corners and turn right side out. I love to use a chopstick to make sure the edges are neat. Give it a good once over with the iron and stuff in your pillow form. Here’s a peak at the back. I love the Amy Butler line. And here’s the finished pillow. I loved making the zig zags and my new pillow is a lovely addition to my living room. Thanks Kari, for letting me visit today! What a clever pillow!! I’m lovin’ the zig zags!! This is gorgeous – now my wheels are spinning with ideas and there are sooo many other things I should be doing today …. I love it when someone comes up with an original pillow and this definitely is! Fabulous tutorial. I couldn’t figure out how you made the zig-zag until I saw the photo! Pure Genius! Thanks for sharing! Yay Calli! Something fresh and inspiring. Absolutely ingenious!! I love the no sew zigzags! oh, wow! How lovely and amazing!!! I need to go make zigzags now! This is terrific! I love it! And you’re right….this would look spectacular on a table runner, skirt or anything really! Holy crap I love this! I have like 600000 things to do today, but now all I want to do is make zig zags! 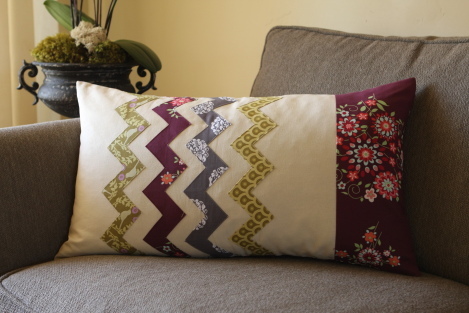 Pretty pillow and great tutorial. Love your ZZ method. Oh my heck! This is Genius! Love it! What a great way to do the zig-zags. I love how it turned out, I’ll have to use this tutorial sometime soon! It’s so creative and beautiful! I must try this! THanks for sharing, ladies! I love that! It would be perfect on my couch! Thanks so much to both of you, I’ll be linking. That is so smart! I never would have thought making zig zags would be so easy! And they look so good! I love it! 🙂 Thank you for sharing! Oh, Wow!! think I may do this for the girls’ with fabric to coordinate their quilt! You are a super genius! 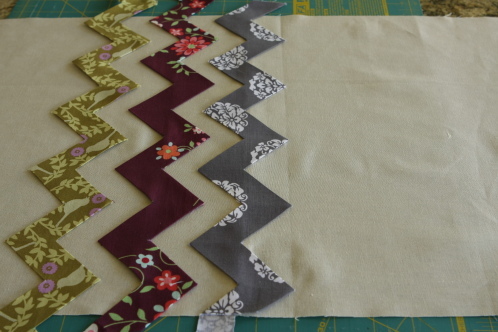 LOVE the zigzag tutorial….can’t wait to use it on a baby quilt I want to make. Thanks for sharing and easy trick! That is too dang adorable!!!! I think I may need one of those! awesome tutorial! i love th way you did the zig zag. thank you! This is sheer genius! Thank you for sharing!! Just the tutorial on making a zigzag is amazing! 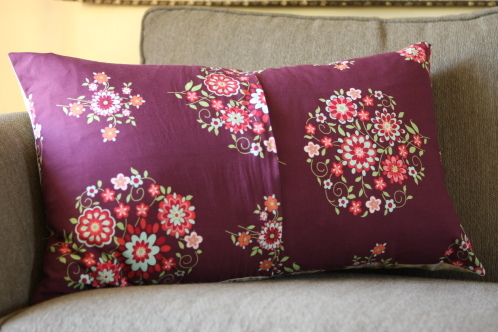 The pillow is gorgeous too! Wonderful guest post. The fabric choice is gorgeous and the zig zag technique is so clever, almost a geometry problem. I absolutely love this!! I’m obsessed with chevrons/zigzags. Never in a million years would I have figured out how you made these… thanks so much for the awesome tute!! Very clever. It has a Missoni feel about it too. Love it. Amazing! The zig zag method is brilliant! Gorgeous pillow. Totally love this! Thank you so much for taking the time to put the photo tutorial together!!! Greattly appreciated. the way you made the zig zags is so inspired! I’m planning to make my own version of this pillow this week. Summer is basically over and I finally figured out the pillow I want for the front porch bench. thanks!